Overall Seat Width: 28" x 28"
Does your corner seats have under the seat storage? Yes. Our 28" Corner Pontoon Seats have open storage underneath the cushion. It is the same shape of the base itself. Trying to determine the length? These 28" Corner Pontoo Seats are 28" by 28". The have an estimated 8" radius for the corner of your pontoon boat. How much does the 28 much corner section weight? The 28" Corner Pontoon Seat weighs a total of 58 lbs. Does the corner seat need railing to support it, or can it be free standing? This corner pontoon seat needs to be supported by the rail on at least one side. Both side do not need to be supported though. If you click on the link below it will take you to our customer photos you will see an example in the first picture where the customer has one side of the 28" corner seat against the rail in the front of the boat. The back side of the seat that is positioned by their pontoon gate in front of the console is not supported. I'm sorry but we do not currently offer indiviual seat covers for our seats. We are working on this and hope to offer them in the future. When buying individual seats, do they come with the necessary hardware (nuts & bolts)? 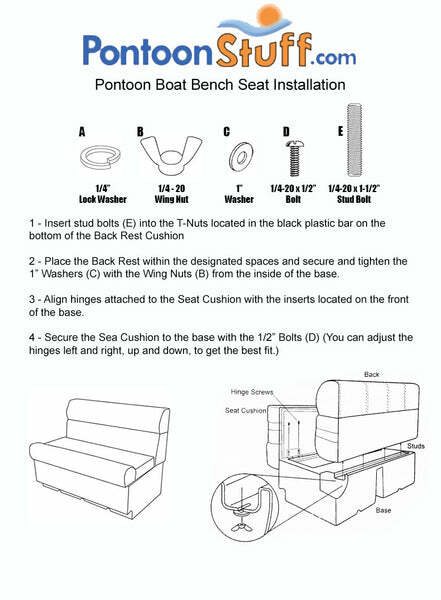 Yes, when buying individual pontoons seats all the seats will come with the necessary hardware to install them into your pontoon boat. I'm confused on how the measurements are. Is the actual measurement 28" from side to side or 56" from side to side (14" middle to side,totaling the 28")? Each side of this pontoon seat measures 28" inches in the back. I'm sorry to hear that you lost your pontoon seat cushion. Yes of course, Please give us a call at 1-877-295-9522 and e-mail us at support@pontoonstuff.com and we will get you taken care of. what do they mean by depth when measuring? How deep a seat is determines how far the seat will come into the walkway. This is concidered depth. When figuring the length in inches across the back section on my pontoon, how many inches would I need for a corner seat, a 38 inch seat and 7 inch seat end. I'm just not certain how many inches I will need across the back when I put these together? In other words, I'm not sure how many inches to allow for the corner seat portion across the back. I assume the same would apply to the side portion. Our 28" Corner Seats are 28" by 28". So, Adding the 28 inches to the 38 inch seat and 7 inch arm rest would give you a total of 73 total inches.